Every Friday, over on my Memoir + More blog, I take a virtual walk in London. I'm looking forward to a trip to Baker Street where Sir Arthur Conan Doyle's Sherlock Holmes comes alive with the rooms recreated from the books. I've virtually seen the neighborhood where Charles Dickens kept his mistress and can't wait to see the Charles Dickens museum itself. Here in the states we took a boat ride down the Hudson one summer and visited Washington Irving's home, Sunnyside, in Tareytown, New York. The whole area, with its gentle green hills and historic architecture look like one big Sleepy Hollow. Last year we toured Ernest Hemingway's Key West home and saw the office where the legendary writer had a standing desk. And, oddly, one of the things I came away with after reading Gone Girl was a yen to visit Mark Twain's home in Hannibo, Mo. 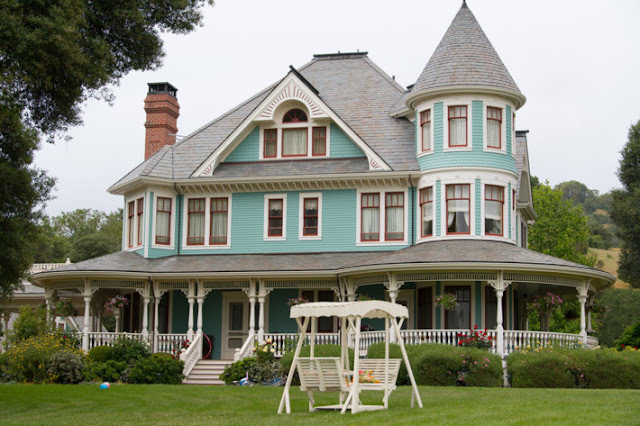 In New York, of course, there are tours of writer's haunts and houses galore. But I live in L.A. where open air buses packed with tourists troll the city pointing out the places where famous actors eat their salads. For $10 you can buy a map to the star's homes. We are, after all, a city that exists on the making of movies. 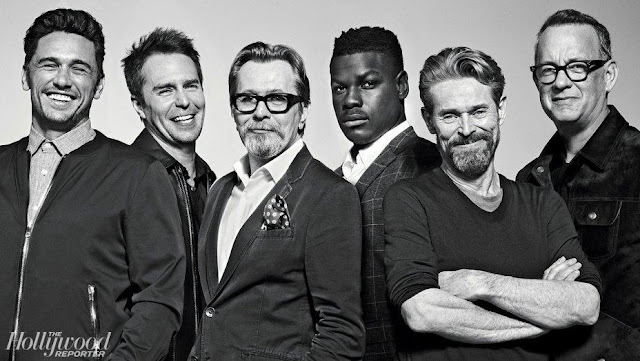 Movies scripted by many a respected author turned screenwriter. But where is the map to the writer's homes and haunts here in L.A.? Where are our museums to iconic writers like Raymond Chandler, Charles Bukowski, James Cain, F. Scott Fitzgerald and Edgar Rice Burroughs—where a whole city (Tarzana) is named after his Tarzan creation? Noodling around on the net I was thrilled to find Esotouric, a company that takes you on extraordinary explorations of the city including a Bukowski "Haunts of a Dirty Old Man" tour and "In a Lonely Place: Raymond Chandler's Los Angeles"
"Through published work, private correspondence, screenplays and film adaptations, we trace Chandler’s search for meaning and his anti-hero Philip Marlowe’s struggle to not be pigeonholed or give anything less than all he has, which lead them both down the rabbit hole of isolation, depression, and drink." Co-owner Kim Cooper only runs this tour a few times a year, with one of the upcoming dates being July 30th. The four hour tour costs just $58. Don't have one thin dime to spare? 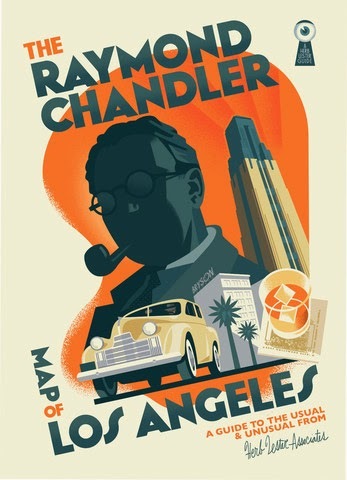 The Raymond Chandler Map of Los Angeles costs just $10. Visit Esotouric or Kim Cooper—who also wrote the Raymond Chandler inspired novel The Well-kept Girl—for more details. While James Cain—who reportedly lived near the Hollywood sign—wrote the novella, it was Chandler who wrote the screenplay for Double Indemnity. 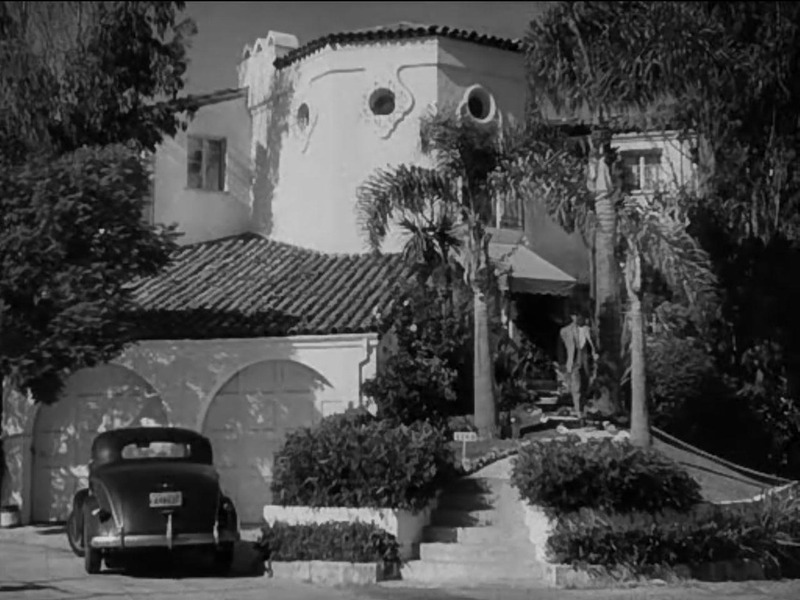 There is much more to Raymond Chandler's Los Angeles to be sure, but I'm wondering whether the location of the house from Double Indemnity* is on the tour? I guess I'll have to pony up my own money to find out. Naturally, Double Indemnity, written by James Cain, scripted by Raymond Chandler with Billy Wilder is our Saturday Matinee. 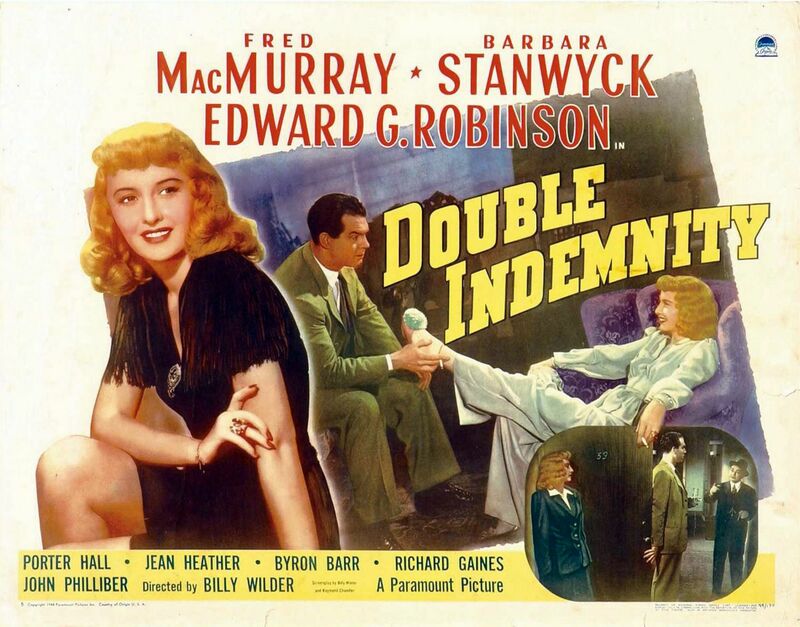 Starring Fred McMurray as the insurance salesman —for someone like me, growing up watching him as dad on My Three Sons, seeing McMurray turn murderer took a bit of getting used to—and Barbara Stanwyck as the noir seductress, Double Indemnity was directed by the legendary Billy Wilder. Nominated for seven academy awards—Best Picture, Billy Wilder for directing, Barbara Stanwyck for Best Actress as Phyllis, John Seitz for cinematography/black & white, along with the score, sound and the screenplay by Chandler with Billy Wilder, Double Indemnity got nada. Zilch. 7 noms/0 wins. Go figure. You ought to watch it anyway. Which you can do for a few dollars on Amazon, YouTube, iTunes, Vudu and GooglePlay. *Pssst! 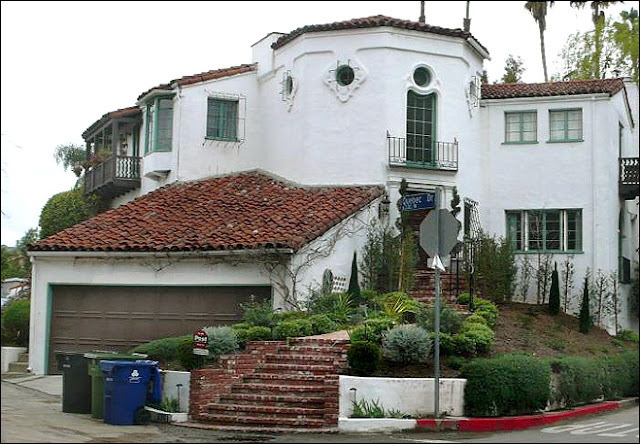 The Double Indemnity house is located at 6301 Quebec Drive, Los Angeles, 90068 in the Beachwood Canyon area of the Hollywood Hills. 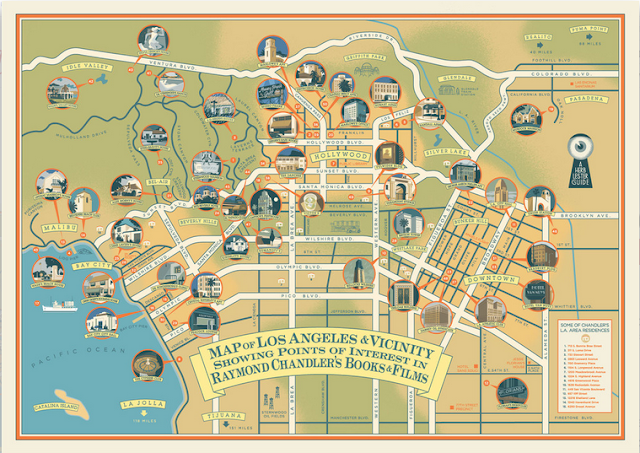 Just heard from the peeps at @esotouric who tell me their bus is too big to go up into the hills to see the Double Indemnity house BUT the do the 'death drive' from Double Indemnity on their Birth of Noir tour. So check 'em out at Esotouric.com!